This pork comes with a ringing endorsement from the BOY. On my way home from work last night, I called him and he tried to get off the phone quickly. He said that he was eating dinner (the pork) and I think he said it was incredible, but it was hard to tell while he was chewing. Then he raved about the flavor before hanging up to finish his dinner! I don’t eat pork often, but I do like pulled pork on occasion. I have never made a dry rubbed pork before. When I saw this on Everyday Maven, I thought I’d give it a try. When we opened the pork, it had a lot more fat than I realized. I tried to cut it off with a knife, but it wouldn’t budge. Luckily, the BOY came in with his brand new knife and removed it with one quick swipe. I placed my marinated pork in the fridge for a few hours and then thought about when I was going to make the pork. It takes about 10 hours and the plan was Monday night dinner. What I ended up doing was putting the meat in the crockpot Sunday night and then cooking it overnight. I was a little worried with so little liquid that the pork would be dry, but we woke up Monday morning to a delicious smelling house. My second fear was that Cooper was going to wiggle his little nose into the crockpot overnight, but he seems to have left it alone. The BOY is still raving about this pork (he had it again for leftovers tonight). Even after last week’s pain and torture, I went back to see my trainer this morning. The verdict…I still hate the anaerobic zone and I’m pretty sure it hates me too. I also may have pulled an ab muscle, but I’m not sure how. Yesterday morning, I went for a run. There were two things driving me to get out the door. Number one is this upcoming 8 mile ‘race’. I use the term lightly with the additional air quotes because I’m not planning on racing it as much as I am running it. Number two, these beautiful fall mornings. The weather is PERFECT for running, the scenes along the path gorgeous, and yesterday I saw a huge male deer along the side of the path. We had a major stare down but he didn’t move. I couldn’t believe I didn’t have my camera. It was such a majestic site. I ran 5 miles yesterday and am planning on another 4 on Thursday, taking Friday off, and then having a happy and successful 8 mile run, no time goal in mind on Saturday. Like I said before, this is just an attempt to delay the end of race season a little bit longer. Combine all of the seasoning in a bowl. Using your hands, spread the rub around the pork. Place in the fridge for a few hours or overnight. Then place your pork along with the stock (I used chicken) and bay leaf in your crockpot and set on low (8-10 hours). Cook and leave it alone for set time. Then shred with two forks or it should just fall apart. You can drain the liquid or I let the pork soak up the liquid and flavor. Use for a sandwich or tacos! I’ve seen a bunch of recipes on your blog that I have saved for later. YOu’ll have to tell me if you make this one how it compares! 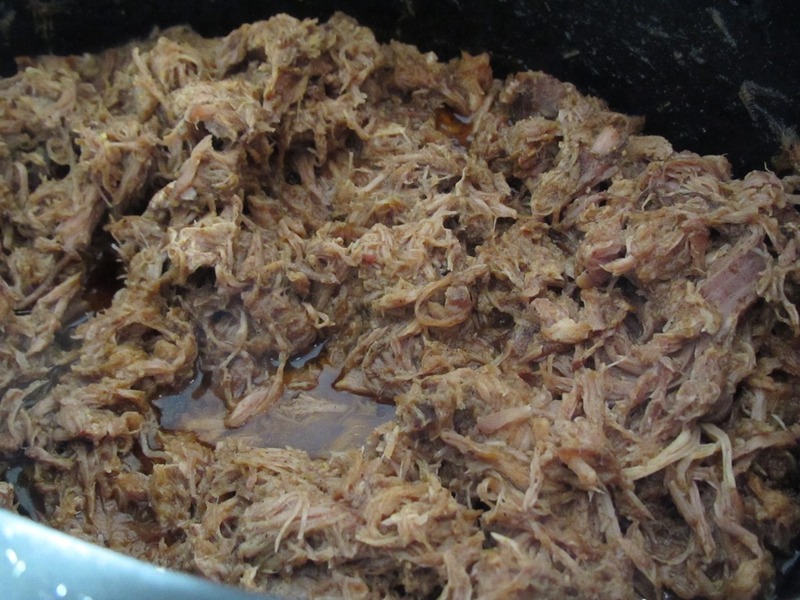 Pulled pork in the crock-pot is one of my favorite winter foods! Good luck this weekend! I, too, am loving this running weather (though I really do miss summer)! 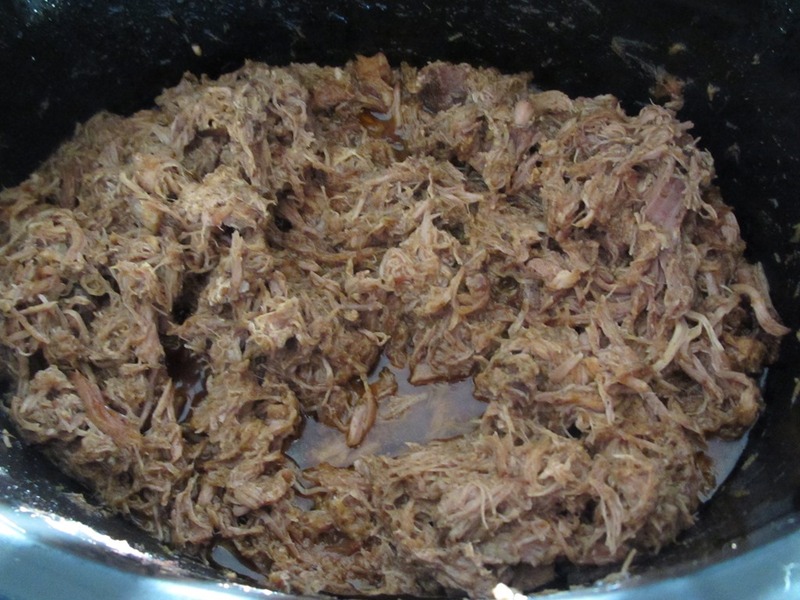 Pulled pork in the crock-pot is one of my favorite winter meals! Good luck this weekend! I, too, am loving this running weather (though I really do miss summer)! I don’t miss summer yet. This is my favorite time of year! And the crockpot recipes sure do help! It was really good! Getting the BOY’s rave reviews says something for sure! Yes, I’m happy that I can appeal to his meaty side : ) I was thinking I could even use some leftovers for enchiladas!